With one of the country's most closely-watched gubernatorial races still too close to call, Georgia could be heading for a run-off election. Democratic candidate Stacey Abrams currently trails Republican Brian Kemp, who is Georgia's Secretary of State and as of Wednesday morning has nearly 51% of Georgia's 3.8 million reported votes, according to the Associated Press. 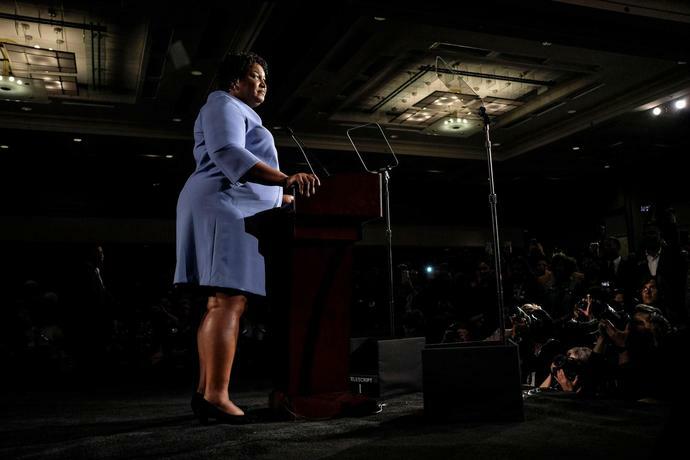 But in a speech to supporters early Wednesday, Abrams - who would be the nation's first female black governor if elected - said votes still need to be counted, and she will not concede the race until that happens. "We believe our chance for a stronger Georgia is just within reach, but we cannot seize it until all voices are heard, and I promise you tonight we're going to make sure that every vote is counted," Abrams said. Kemp has not yet officially declared victory, but said in a speech to supporters early Wednesday morning that he remains confident. "There are votes left to count, but we have a very strong lead," Kemp said. "And folks, make no mistake, the math is on our side to win this election." TIME could not immediately reach Kemp's campaign for comment. Jennifer McCoy, a political science professor at Georgia State University, says Kemp's confidence may be unfounded, given the higher-than-average number of absentee and provisional ballots used in Georgia this year, many of which have yet to be tallied. If enough of those votes go to Abrams, McCoy explains, a run-off could be triggered under Georgia law, which states that a gubernatorial candidate must receive more than 50% of the vote to win. Kemp currently has the necessary majority of the vote, but "the possibility is that his percentage could come down" as more ballots are counted, McCoy says. Abrams is "not refusing [to concede] on the basis of nothing. She's just saying, 'Let's wait until we actually count every last ballot,'" McCoy says. "Even if [Kemp's percentage drops to] 49.9%, it would go to a run-off." That possibility is feasible, McCoy says. Concerns over the age and quality of Georgia's voting machines led an unusually high number of people to use absentee ballots this year, McCoy explains, and some of those ballots are still being counted. Plus, many Georgia residents saw their voter registration status flagged this year - leading some to allege that Kemp, who presides over Georgia elections in his role as secretary of state, was intentionally suppressing minority votes (he has denied those charges). Many of these flagged voters had to use paper provisional ballots, which in some cases require voters to return to their county election board within three days to prove residency or citizenship, McCoy says. As such, ballots could remain uncounted until at least Friday. Abrams' campaign said in a statement provided to TIME that she needs only about 24,400 more votes to trigger a run-off. The campaign said as many as 77,000 mail-in ballots, many from heavily Democratic counties, have yet to be reported, as well as absentee and provisional ballots. Until these votes are counted, the campaign said, the race isn't over. McCoy says voters could find out whether there will be a run-off as soon as Wednesday or Thursday. If one is triggered, it will be held on Dec. 4. The difficulty for both Abrams and Kemp, then, would be getting voters to return to the polls. "The challenge then for both candidates, for both sides, is actually to get people to come back," McCoy says. "Typically the turnout drops for a run-off." No matter how many people vote, however, either Abrams or Kemp would win a run-off. Only the top two candidates would advance to a second round of voting, leaving Libertarian candidate Ted Metz, who got about 1% of the vote on Tuesday, off the ballot. With the race as close as it is, McCoy says Kemp should step down from his role overseeing state elections, if not his secretary of state post entirely. While ballot counting is completed at the county level, McCoy says Kemp's office is tasked with resolving election disputes - which are fairly likely, given the high number of people voting with provisional ballots and the contested nature of the race. Georgia law also says that the secretary of state may direct a recount if the difference in an election comes down to less than 1%, or if a candidate alleges any errors during the electoral process. "For his own legitimacy and perceptions of ethical integrity, I think he should [step down]," McCoy says. But "he hasn't yet, so I haven't seen any signs that he will." Whatever the result of the contest, McCoy says the election speaks to the racial factors that still play into American politics, with exit poll data showing that Georgia residents largely voted along racial lines. "There's still a pretty stark racial divide," McCoy says. "That raises questions for the state and the country … about to what extent are we ready to be a multi-racial country."